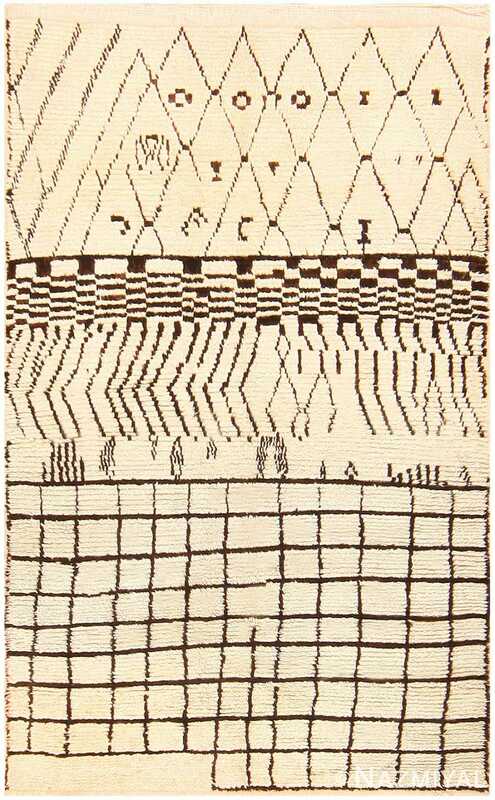 African Rugs and Textiles – Textile weaving has been an important part of various African civilizations for millennia. The ancient Egyptians were some of the first people to use the loom, around the year 4000 BC. In most regions, the labor was split between the sexes: the women would dye and spin the thread, while the men would do the actual weaving. 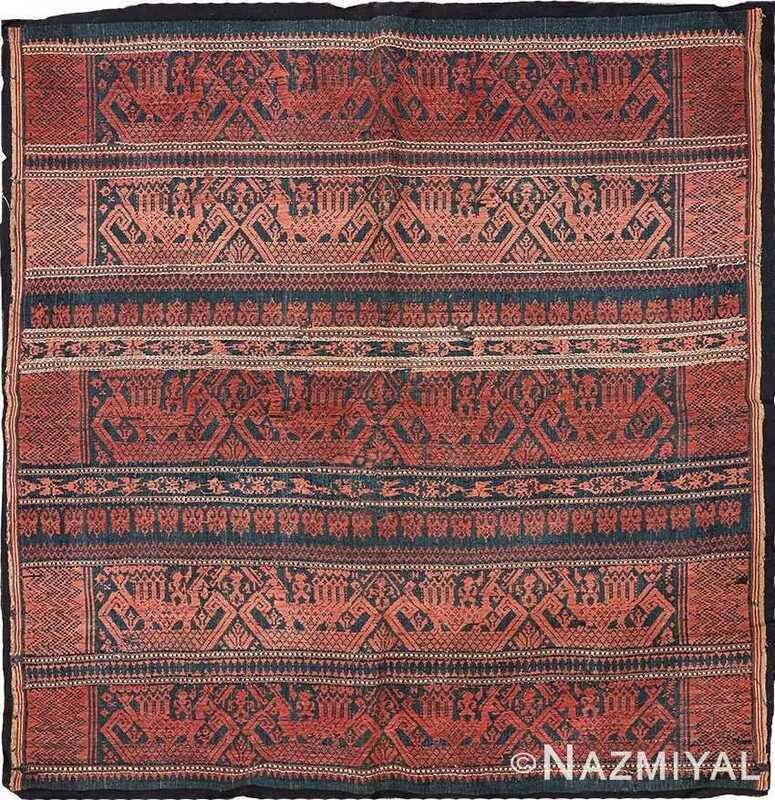 The rugs of North Africa, including Moroccan and Tunisian, are particularly famous, though many other African societies have created unique textiles that have warranted global attention. 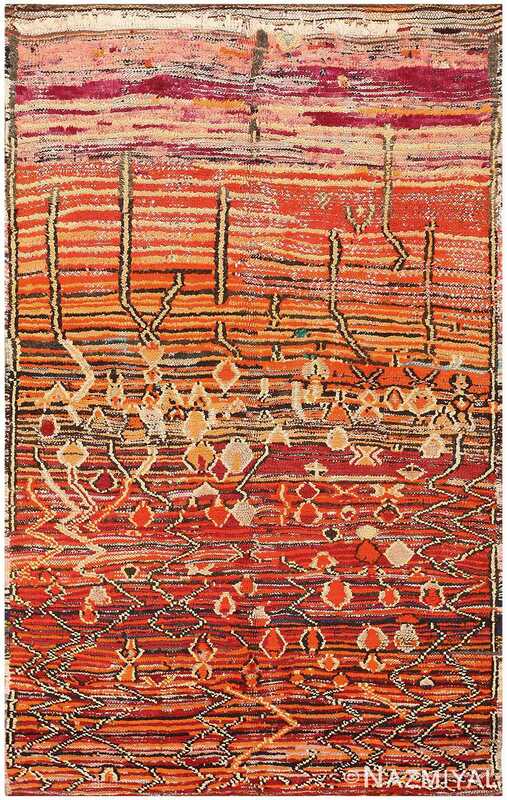 Rugs woven by the Berber people of Morocco are particularly popular on the international scene. These Moroccan rugs traditionally were made of wool from black and white sheep, and the materials they used were not dyed. They often told a story about the weaver’s life while also serving a practical purpose, helping to keep their owners warm during the cold nights they would spend on the Atlas Mountains. 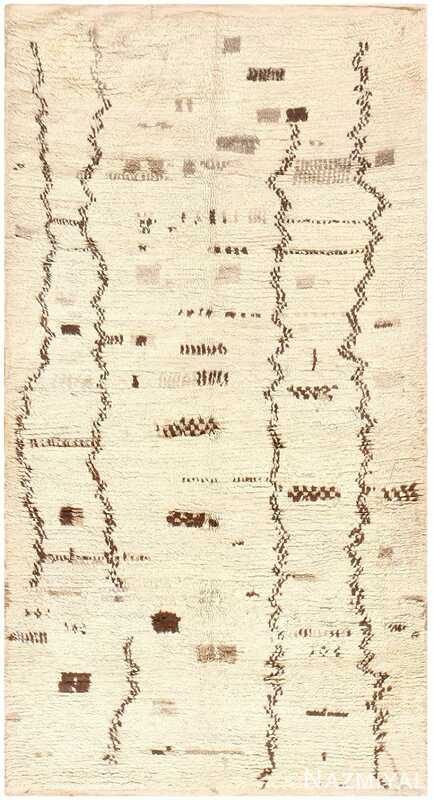 Many African societies used textiles as a means of communicating messages, weaving historical stories and conveying symbolism. The Ewe would weave Kente cloths that had particular meanings depending on the colors used, for example. 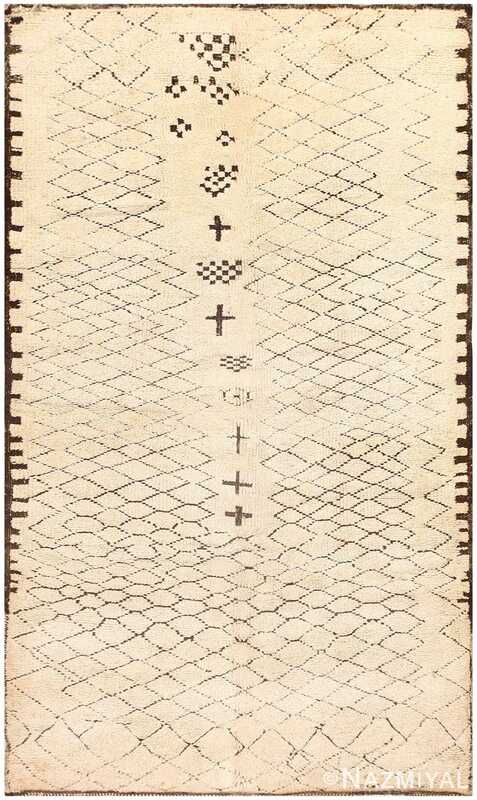 Similarly, Andinkra fabrics had symbols stamped on them using black ink. Each of these symbols held a specific meaning, and together would convey a message or story to anyone who could decipher them. With such a long history of textile-weaving and such a diversity of cultures, it is no wonder that the continent of Africa has produced so many different symbolic interpretations of this ancient art form. African Influenced Interiors – Bright colors and animal imitations are no longer featured in the far-away villas of vacation homes. Now, African influenced style is showcasing in eclectic interiors everywhere, adding elements of exotic sophistication to modern residences. The movement pulls sculpture, wallpaper, antique rugs and ritual art into the home. But, the most compelling characteristics are the bold hues and competing patterns that define African design. In African culture, colors and patterns hold symbolic meaning. They are emblematic of the land and beings around tribes. According to African legend, the very first textile design was a spider web pattern, a mirror of what two boys witnessed in action and recreated in print. Today, African influences hold less of this traditional meaning, but their essence remains the same. The mixed motifs and textures they add to a space brings out feelings of nature and project a calm, international presence. 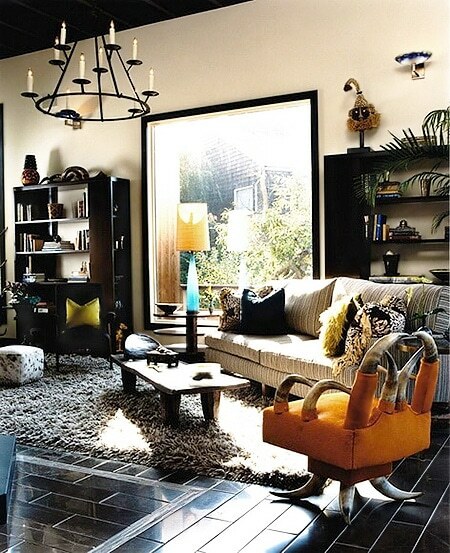 Beyond the psychological comfort African influences bring to the home, is the trend’s versatility. From a single animal rug, to rooms of full-on safari chic or scattered with tribal pieces, African influenced style works with any and every interior design. Detail lines are presented in a slightly idiosyncratic manner, rather than in a conventional grid pattern. 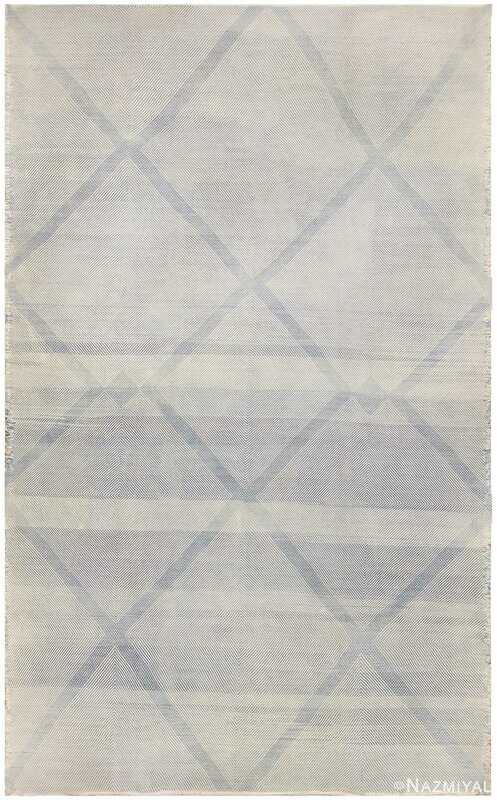 This small touch infuses this rug with a deep sense of the abstract. 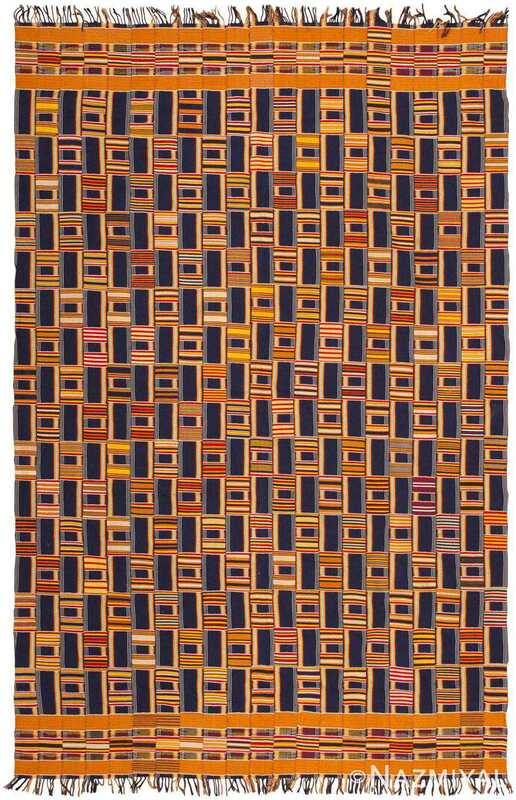 This stunning antique Ewe Kente cloth showcases an expansive array of vibrant, warm and beautiful striped patterns that are unique to African strip-weaving. 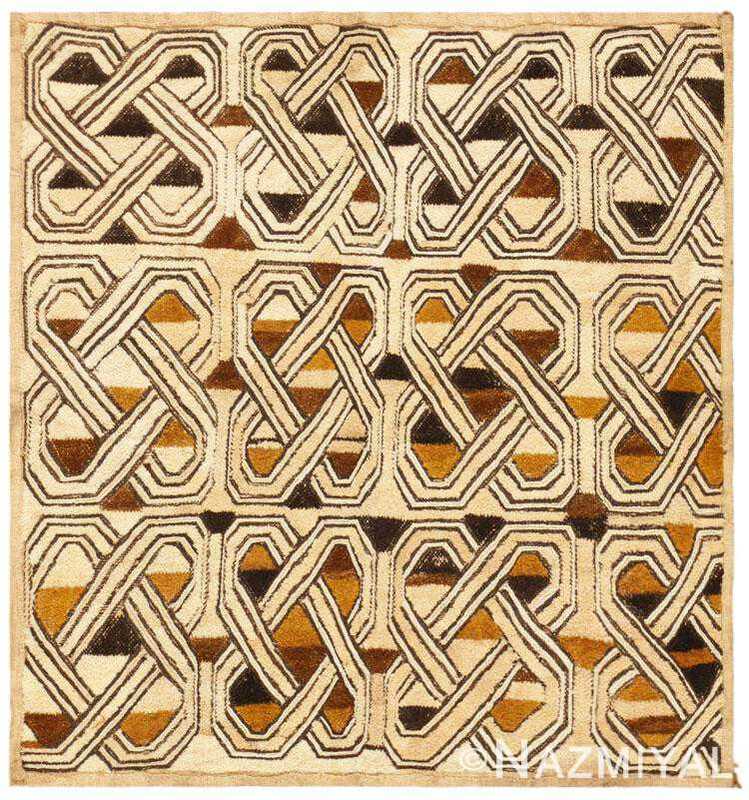 Charming endless knots with angular contours create a stunning repeating pattern that decorates the compartmental body of this chic antique Kuban rug from Africa. 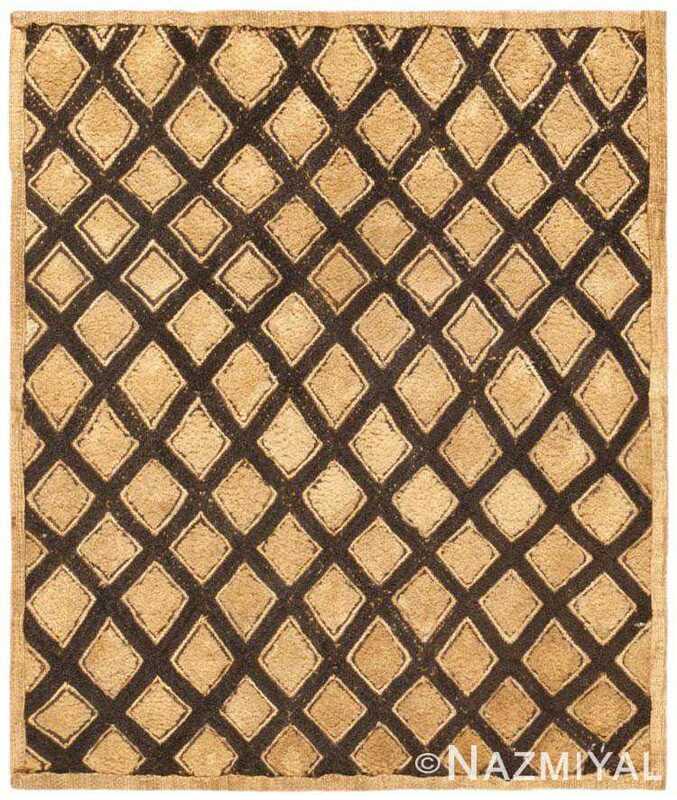 Created in Africa, this antique Kuban mat depicts a graphic pattern of geometric lozenges set over a rich cocoa-brown ground that forms a bold latticework pattern.